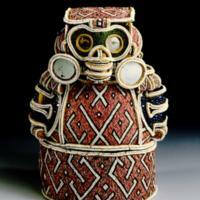 Zemi figures, believed to represent dead ancestors, were common in the Caribbean in the pre-Hispanic period. They continued to be used during the first decades after the arrival of the Europeans. However, Spaniards in the New World often destroyed zemis, since they saw zemi-worship as impeding native Taíno conversion to Catholicism. This zemi is a Janus-faced figure: this side depicts a skull or a bat. It wears large mirror earrings made from Venetian glass. The mirrors may be shamanistic devices, their shiny, reflective surfaces allowing shamans to see into otherworldly realms. Vivid green glass beads surround the eyes. While the color is reminiscent of jade, a material that was highly valued in the Americas, these beads were brought across the Atlantic by Spanish explorers to be used as gifts and for trade. The pink and white beads that dominate the figure's body were drilled from Caribbean shells. The bottom band is made of a belt like those that Taíno political leaders wore, a sartorial sign of office. It is wound around the figure one and a half times, and if detached, could have been worn by a human being. While we know nothing of the Taíno who made this zemi, the figure was probably commissioned by a cacique who dealt with the Spanish conquerors of Hispaniola. Only high-status individuals would have had access to the prized European trade goods directly incorporated into, and indirectly inspiring, this piece. The materials used to create the piece suggest the flexibility and creativity of Taíno craftsmen. Native Caribbean materials (the pink and white shell beads) were integrated with green glass beads and mirrors of Venetian glass from Europe and rhinoceros horn (used for the human face) from Africa. The whole figure measures 32 cm in height (ca. 12.6 inches). This zemi was probably sent to Europe in the early 16th century, where it would have been valued as a curiosity. If it had stayed in the Caribbean, Europeans (colonial leaders and/or friars) most likely would have perceived it as a dangerous idol and destroyed it. By 1680, this zemi was in Bologna, Italy, in the collection of a wealthy, intellectual family (the Cospis), along with other New World curiosities. Once in this collection, signs of its cross-cultural heritage, evident in the materials of disparate origin, were (until recently) eclipsed by European conceptions of the exotic. Archivo Fotografico del Museo Preistorico Etnografico Luigi Pigorini, Roma. Photo by Lorenzo Demasi. All rights reserved. Bercht, Fatima, et. al. 1997. Taíno: Pre-Columbian Art and Culture from the Caribbean. New York: The Monacelli Press and El Museo del Barrio. Gruzinksi, Serge. 1994. La Guerra de las imagines: de Cristóbal Colón a “Blade Runner” (142-2019). México: Fondo de Cultura Ecónomica. Oliver, José. 2009. Caciques and Cemí Idols: the Web Spun by Taíno Rulers Between Hispaniola and Puerto Rico. Tuscaloosa: University of Alabama Press. Pané, Ramón. 1974. Relación acerca de las antigüedades de los indios. El primer tratado escrito en América por Fray Ramón Pané. Nueva versión, con notas, mapa y apéndices por José Juan Arrom. Mexico: Siglo XXI Editores. Taylor, Dicey, Marco Biscione and Peter G. Roe. 1997. 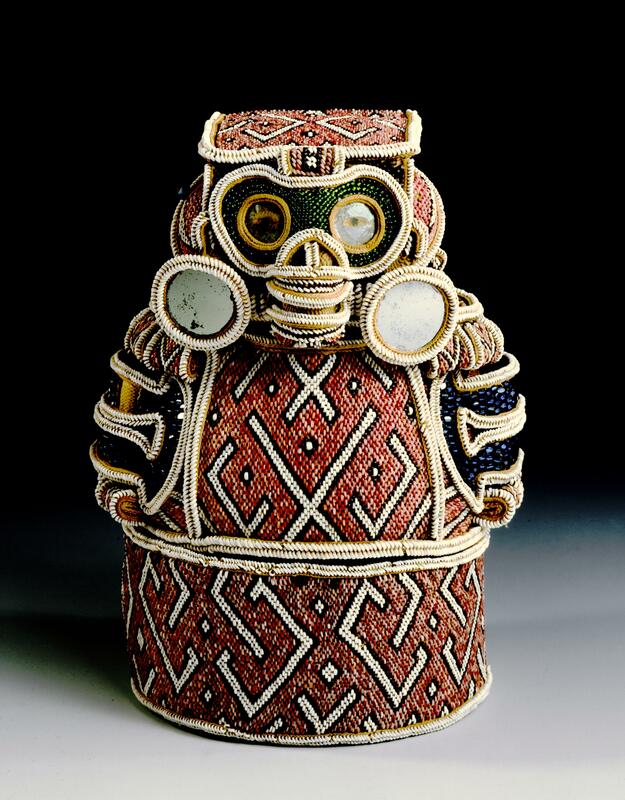 “Epilogue: The Beaded Zemi in the Pingorini Museum.” Taíno: Pre-Columbian Art and Culture from the Caribbean. New York: The Monacelli Press and El Museo del Barrio, 158-169. Vega de Boyrie, Bernardo. 1973. “Un cinturon tejido y una careta de Madera de Santo Domingo, del periodo de transculturación taíno-español.” Boletín del Museo del Hombre Dominicano 3: 199-256.